What should we do about the Moon? Hafiz wrote a poem about a wine bottle that fell off of a cart in a field and all of the beetles and insects got drunk on it and began to play music as they discovered seeds that they could drum upon. And this, he says, “made God happy.” Then one of them noticed the moon rising and said, “What should we do about that moon?” They put their instruments down and began to tackle together this “profoundly useless question.” And I ask tonight as I’m paralyzingly arrested in the middle of my chores looking out my back door at the mist hugging the mountain, “What should I do about that mist?” I listen to the crickets and night sounds and stop everything. “What should I do about these sounds?” The lightning bugs are just beginning to light up the forest from floor to ceiling. “What should I do about the lightning bugs?” These profoundly useless questions are haunting. This entry was posted on June 1, 2010 at 10:55 pm and is filed under Uncategorized. You can follow any responses to this entry through the RSS 2.0 feed. You can leave a response, or trackback from your own site. What a thought-provoking post. I often ask myself a question in a similar vein about the universe–if the universe has a boundary, what’s outside of it? What could possibly be outside the universe? And if the universe doesn’t have a boundary and just goes on endlessly . . . well, that’s even more mind-boggling. I know there’s no answer to this, at least on this plane of existence, but I still wonder. It makes my brain hurt, but in a good way. 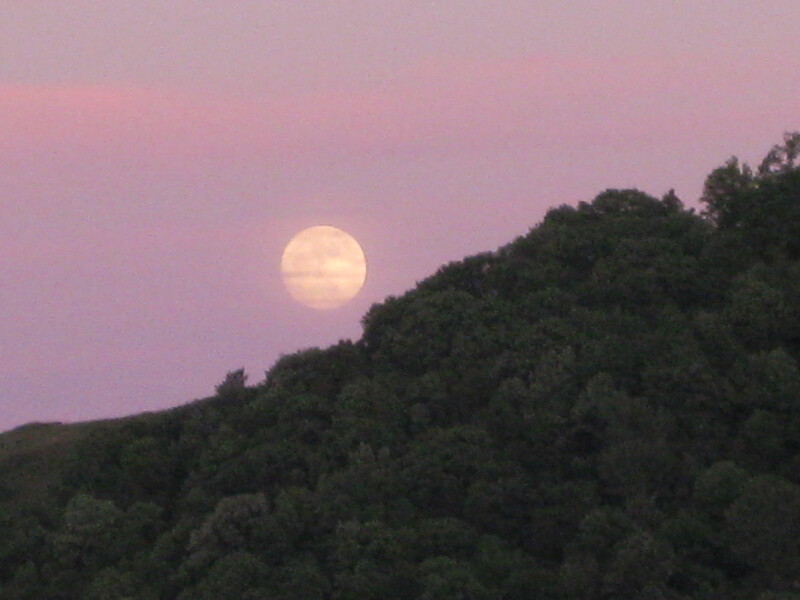 And what a beautiful picture of the moon–wow–ivory in a lilac sea.